It’s funny how flexible the internet is, yet we don’t have technology to write directly on webpages in a browser and immediately share that marginalia. When reading an article on a piece of paper, you have an immediacy with that sheet of paper where you can underline text and write notes in the margin. When reading an article in your browser, we can’t immediately underline text, nor can we write notes in the margins. Digital technology is praised for being so feature-rich and flexible over print on paper. Yet, paper still trumps technology when it comes to marginalia on articles. 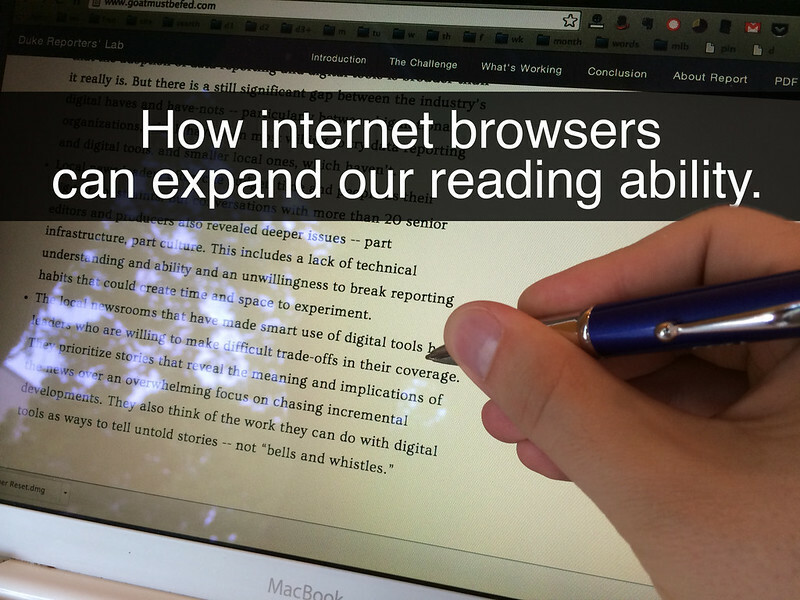 Yet, the very action of reading and notating while reading is lost in the browser. It’s as though we are reading articles behind an impermeable glass. Only once you are done reading can you release the article through comments, sharing, or saving the article as a PDF. Our society is losing something through our readers not being able to engage with their texts while reading the text. We only engage with the text after we are finished reading. Or if you are like a large number of twitter users, you don’t even read the article before sharing it. I’d like to see a deeper engagement with our reading. What is the reason why we haven’t seen browser technology develop that allows people to directly highlight and comment on text in the margins? Perhaps there isn’t the demand. Most readers don’t want to engage with texts in this fashion. Or perhaps publishers fear releasing their texts to this sort of interaction. A reader who can write directly on the text and share it with others, is a reader who takes ownership of the text and manipulates it to his/her own thoughts. Perhaps publishers fear readers having the ability to mold and shape the texts they publish. I look forward to a world where people engage deeper in texts. Let’s get a browser that will allow us to write directly anywhere on webpages, save that webpage, and immediately share our comments both large and small to any social media channel and blogging platform. Does your content hide behind a play button?